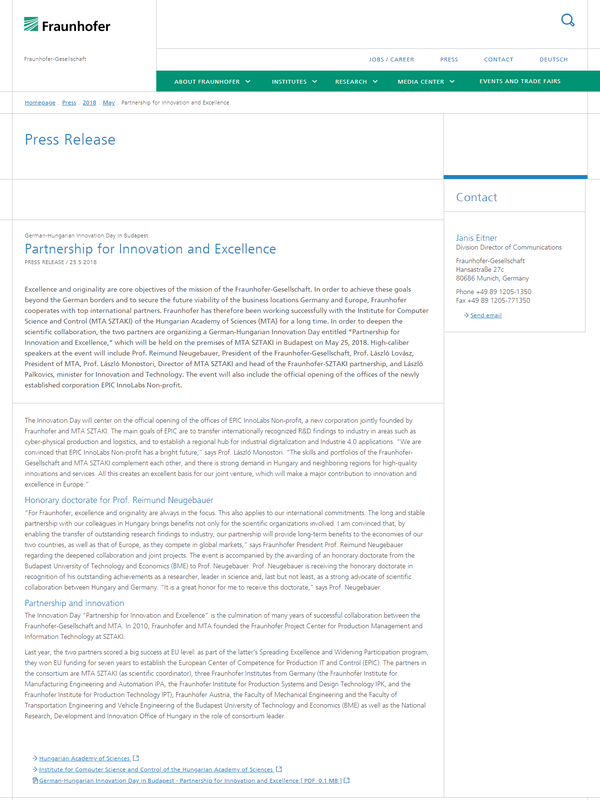 Excellence and originality are core objectives of the mission of the Fraunhofer-Gesellschaft. In order to achieve these goals beyond the German borders and to secure the future viability of the business locations Germany and Europe, Fraunhofer cooperates with top international partners. Fraunhofer has therefore been working successfully with the Institute for Computer Science and Control (MTA SZTAKI) of the Hungarian Academy of Sciences (MTA) for a long time. In order to deepen the scientific collaboration, the two partners are organizing a German-Hungarian Innovation Day entitled “Partnership for Innovation and Excellence,” which will be held on the premises of MTA SZTAKI in Budapest on May 25, 2018.